Zermatt is one of the best ski resorts in Switzerland. At almost 4000 metres above sea level. you can find the highest ski area of the alps. With guaranteed snow conditions and the ability to ski and snowboard 365 days a year, ski holidays in Zermatt offer access to the most extensive and best-developed ski resort in the whole world. After spending the day on skis (or doing any of the other great activities for non-skiers), you can enjoy some time in one of the many great bars or restaurants Zermatt has to offer. The mountain town even has two Michelin-starred restaurants and boasts 17 restaurants that have been awarded Gault Millau points. Alternatively, you could also just lean back and enjoy a spa treatment or go on a cosy stroll through this cute Swiss alpine town. No matter what Swiss Winter Activity you prefer, you will most likely find it in Zermatt. Overlooking the rooftops of central Zermatt and offering amazing Matterhorn views, this is one of the best 5-star hotels in Zermatt. Facilities include a boardroom, cavern club, lounge bar and DVD rental. Well equipped gym and spa area on-site. There is an indoor pool which spills outside and outdoor whirlpool facing the Matterhorn. This is the best hotel in Zermatt and is directly located on the ski piste. Most rooms are equipped with a balcony. Amenities include a heated outdoor pool, saunas, steam room, sun terrace, hot tub, and solarium. This is Europe’s highest spa and pool. There is also a billiard room and two bowling alleys. This 5-star resort in Zermatt is located right next to the ski slopes and hiking trails. It consists of 7 chalets in Zermatt. Each of them comes with its own terrace with Matterhorn view, massage room, wellness area with a sauna, steam bath and a relaxation room with an open fireplace. Great mid range hotel near Zermatt train station. The spa area offers a steam bath, solarium, whirlpool, and sauna. Only a short walk to the lifts, shops, and restaurants. Cosy lobby with an open fireplace. An on-site restaurant serves traditional Swiss food and Valais specialities. Pets are allowed. Free WiFi. This 3-star hotel in Zermatt is located in a calm quarter, only a ten-minute walk from the train station. Rooms have a cosy and homely atmosphere. Rich breakfast is included and you can relax after an exhausting day in the hotel bar or lounge. Well equipped on-site gym. Pets allowed. This great and affordable hotel in Zermatt is located in the town centre, close to the train station and the Gornergrat Railway. Chalet-style rooms decorated with wood. Each room has a minibar, safety deposit box, and a private bathroom. Most rooms have a balcony. Apartments with fully equipped kitchen are also available. Probably the cheapest accommodation in Zermatt, this hostel boasts great reviews. Single rooms, double rooms, and beds in a dormitory available. The hostel has a table tennis table and a table football table. Washing facilities and luggage storage available. Matterhorn view from dining room. This charming accommodation in Zermatt is just a 7-minute walk away from the ski lifts. Close to restaurants, bars, and shops. Le Petit offers fantastic panoramic views of the Matterhorn on its rooftop terrace. Ski room and free WiFi available. Rooms equipped with TV and private bathroom. Delicious breakfast included. Affordable Hotel/Hostel in the centre of Zermatt, only 100m from the train station. Offers single and double rooms with shared bathroom, mixed and female-only dorms and private double or family rooms. Shared living room, dining room and kitchen available. The Hotel Bahnhof also has a washing room and ski room. These Zermatt apartments offer fantastic views over the Swiss Alps and the Matterhorn. The kitchen is equipped with a fridge, an oven, a stovetop, a coffee machine, and a dishwasher. Rooms vary in size from 51 to 153 square meter. Panoramic and Penthouse apartment offer spacious living rooms, wood-burning fireplaces, and balconies with Matterhorn view. These beautiful apartments in Zermatt city centre all come with free access to its wellness area. This includes sauna, whirlpool and a solarium. Apartments all have a kitchenette equipped with a fondue set. Each apartment comes with a Bang&Olufsen audio/video system, a fireplace and a balcony with Matterhorn views. This family-run Aparthotel offers panoramic Matterhorn views and is situated a little way outside the city centre. Free transfer service available. Slopes right in front of the door. Expansive spa area with Finnish sauna, Bio sauna, Kneipp pool, steam bath, relaxation room and Jacuzzi. On-site wine cellar and restaurant serving Swiss and international cuisine. Highest Point : Gobba di Rollin with 3’899 m.a.s.l. Lowest point : Valley Stations with 1’620 m.a.s.l. Artificial snow: 75% of the slopes are covered in artificial snow or are situated on glaciers. There are nine different ski and snowboard schools in Zermatt. You can find and book them here. Follow this link to find a panoramic map of the whole Matterhorn Ski Paradise, including slopes and ski lifts. If you want to find out more about mountain railway tickets, timetables and prices, then you can follow this link to the official Zermatt page. 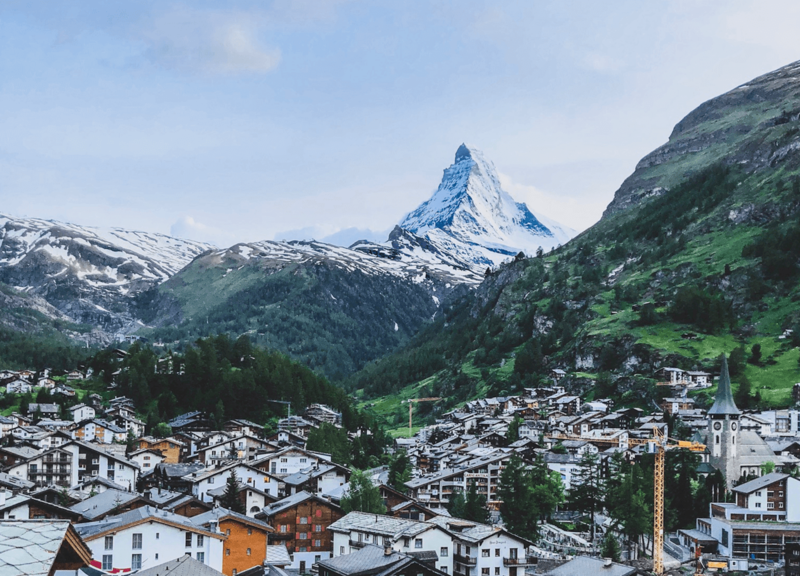 If you are interested in combining Zermatt with the unique Glacier Express experience, then check out the post we wrote about it. We took the Glacier Express from Chur to Zermatt and completely enjoyed it. Also make sure to check out our winter holidays packing list, so you definitely don’t forget anything at home. Are you interested to learn more about Switzerland? Then check out our other Switzerland posts.